Search for the best flight prices from Manchester to Barcelona. Compare prices, book today and save money with Manchester Airport. 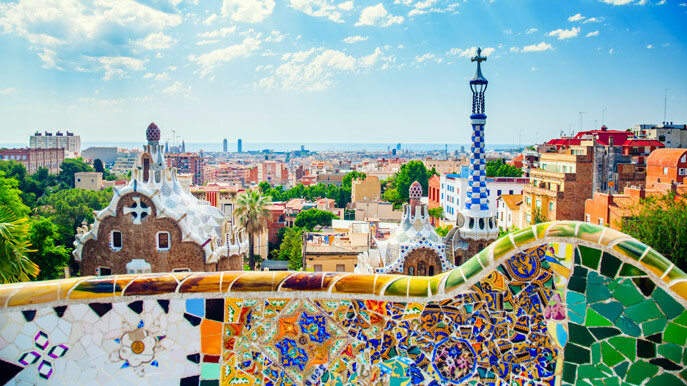 Barcelona is undoubtedly one of the world's most dynamic and stylish cities, with buildings and art to die for. It's party time in summer, in the centre and on the nearby Catalan coast, but the city fizzes all year round to the beat of cutting edge food, fashion, style, music and good vibes. Go and you might never want to leave. Unsurprisingly, given the number of visitors it attracts on a year-round basis, Barcelona has a robust hotel scene. There's a wide spectrum of different accommodation options - from the no-frills appeal of the Travelodge Barcelona Poblenou (Carrer de Llacuna 23-24) to the classic five-star stylings of Hotel Arts Barcelona (Carrer Marina 19-21) - and by consequence there's plenty to cater for those on a budget, as well as those in search of luxury. On which note, the five-star Ohla Hotel (Via Laietana 49) is notable as one of the more recent additions to the top-end market, while the nearby Grand Hotel Central (Via Laietana 30) provides four-star comfort. Souvenirs are everywhere you look in Barcelona, so if you're after a Gaudi T-shirt or an FC Barcelona scarf you won't exactly be stuck for choice. For something more substantial, meanwhile, shopping boulevards like Passeig de Gracia are home to large numbers of designer stores, while the creative El Born district is a great option for picking up items from quirkier independent outlets. On La Rambla, the food stalls at Boqueria Market (Rambla 85-89) are where to head for fresh produce, and not far away the large El Corte Ingles department store (Placa de Catalunya 14) draws plenty of interest during its sale periods. At times it can feel as though Barcelona is permanently engaged in one long mealtime. The prevalence of tapas (and their larger counterparts, racions) means that food is rarely out of mind, as does the local predilection for eating late - it's by no means unusual for people to arrive at restaurants after 10pm. Try Quimet i Quimet (Carrer del Poeta Cabanyes 25) for authentic tapas, or head to the Michelin-starred Cinc Sentits (Carrer d'Aribau 58) for the restaurant often touted as Barcelona's best. For an atmospheric drink, call in at Bar Pesca Salada (Carrer Cera 32), located in an old fish store and serving 24 brands of gin. The big pre-Lent fiesta, with masked balls, musical parades and copious amounts of food and drink. Colourful costumes and packed bars are the order of the day - proceedings end with the symbolic 'burial of the sardine'. A bedlam of firecrackers, beach bonfires and fun-seeking locals, the Sant Joan festival takes place each 23 June - although the days preceding it are often lively too. Cava is traditionally the tipple of choice. A three-day offering at the altar of electronic music and new media, this hugely renowned gathering bills itself as an 'International Festival of Advanced Music and New Media Art'. It hosts thousands of creative professionals, as well as plenty of DJ-based partying. Barcelona's largest highbrow cultural festival gives a public platform for dance, music, circus and theatre. It takes its name from the Teatre Grec on Montjuic, which is still one of the key venues. Held in honour of Barcelona's patron saint, the week-long Festes de la Merce is Barcelona's biggest annual festival: giants are paraded through the streets, concerts are held and the city as a whole enjoys seven days of firework displays and general merriment.